Where did Mel Blanc get his astounding ear and ability to improvise? This program is of music shorts of pre-1930′s jazz bands (Duke Ellington, Hal Kemp) and performers (Bessie Smith, Rudy Vallee, Eddie Peabody, others) which document the era during which Mel Blanc was himself a professional musician playing in Portland jazz bands. This is the music young Mel Blanc heard. Program opens with a live performance from Portland’s newest ukulele orchestra, Honky Tonk Prison. We’re so pleased to have ukulele musicians with us on this night. Mel Blanc was discovered playing ukulele and singing with the Multnomah Hotel Orchestra in 1927. He was nineteen. Kitty From Kansas City (1931) So early that Betty Boop is still a dog, and one named Kitty! She is the title character in a song featuring Rudy Vallee, which he had made famous in 1930. Rhapsody in Black and Blue(1932) Short with Louis Armstrong and Sidney Easton. 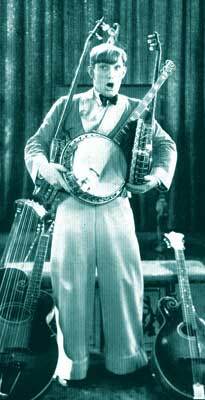 College Chums (1928) Eddie Peabody with Hal Kemp Orchestra. St. Louis Blues (1929) Dudley Murphy directed the only film of Bessie Smith. All films from The Nyback Collection.